Michigan artist Peter Griz has had a creative impulse leading him down paths of inventing and obtaining patents for mechanical devices over the years. But, when he began fabricating and experimenting with metals his creativity has taken its natural course in inspiring him to design kinetic sculptures. His fascination with the possibility of designing a piece of art that could be energizing by the wind producing such a tranquil effect became a passion. Early inspirational ideas for his art work evolved from observing things as simplistic as his grandson's "Delta Flyer" kite and the wind meter on top of a cruise ship. Peter was born in West Virginia and is a self taught artist who retired from Ford Motor Company after 33 years. His experience in design and mechanical aspects enable him the knowledge to achieve the precision and balance in the creation of his kinetic art. Designs are unique and hand hammered using dissimilar metals of copper and stainless steel, then fused together generating sculptural symmetry. These elements coupled together create the wind induced motion of the captivating rhythm expressed in the vitality of his art. 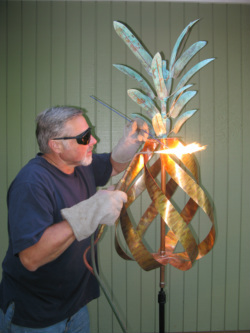 Peter continues to explore new techniques in working with the properties of metal inspiring him to bring new ideas to life.